The beauty of being headquartered in Atlanta, Georgia, a growing city full of potential and promise, is the diverse people who make up the city and drive business. There is so much to learn from a marketing standpoint about brands that leverage and build the community around them - a practice all too familiar to local brands in Atlanta. The Atlanta BeltLine, King of Pops, and Switchyards Downtown Club are some of the most influential local brands in the city who have found success in nurturing and building tribe members. Marketers have the power to do more than just advertise a product with their marketing campaigns, they can bring people together. How can marketers move towards community-centric marketing? At the end of the day, if a brand does not make money, they go out of business. While revenue is a priority an authentic brand with a strong personality and passion is extremely valuable. The founder of the Switchyards Downtown Club, Michael Tavani, believes that a company can “create a community when [the business] has an authentic goal, vision, and point of view on a topic.” During the development of Switchyards, he wanted to build “something genuine,” so he tried to create a culture based on his personal interests that were easy to talk about with like-minded people. In the early days of Switchyards, Tavani leveraged his passions for old buildings, downtown, the rise of Atlanta, the consumer startup scene, design focused startups, and brands to begin to build a following on social media. Not all of Tavani’s interests are represented in Switchyards - a consumer and design-focused startup center that showcases and supports entrepreneurs in the city and hosts networking events for professionals - but he created a comfortable environment for passionate, like-minded individuals to share common interests and openly discuss ideas. 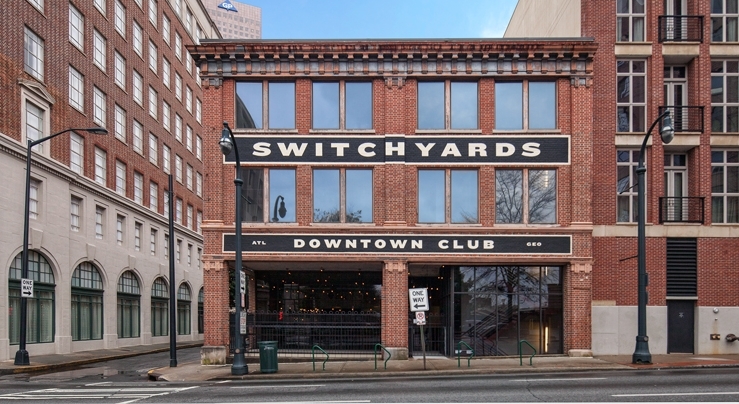 Switchyards Downtown Club located in Atlanta. The mere definition of community ultimately boils down to “connecting” or bringing people together. Identifying a common purpose, passion, or goal unites people. The Atlanta BeltLine is a 22-mile loop that physically brings people together by connecting 45 Atlanta neighborhoods. The urban loop is full of rich cultures, giving people a place to broaden their horizons and experience new tastes of life. Public involvement is encouraged to define and establish the future of the residents’ life on the BeltLine. By providing unique experiences around art, restaurants, exercise, and shopping, the BeltLine has become an engagement point for individuals around the city of Atlanta. As the loop approaches completion, it gives people a chance to build something together. King of Pops hosts free yoga in the park next to the BeltLine. Capturing the consumer’s attention is not the easiest task in the world, but meeting them where they are is always an option. The King of Pops started out as a small popsicle cart in 2010 fueled by social media platforms, and has now grown into a company spread across eight cities in five states. King of Pops is focused on building communities, and not only through its delicious product. Whether it is Yoga in the Park (a yoga event in each of the cities that gets between 200 and 700 people on a weekly basis) or catering a small party, King of Pops wants to be a part of the consumer’s life. King of Pops goes beyond their fun social media presence by actually being physically present at events IRL (in real life). The company also selectively hires vivacious people and encourages employees to showcase their unique personalities. Building a community of loyal followers always begins with leveraging shared passions and rarely is focused on selling or a quick transaction. Brands should take time and care to show the consumer that the purpose of their marketing efforts is to build a tribe first, and potentially sell later. The Atlanta BeltLine, King of Pops, and Switchyards Downtown Club are some of the most influential local brands in Atlanta who have found success in nurturing and building tribe members. How do they build communities and what can marketers take away from the brands’ mentality?